That time is almost upon as we return to hostilities with our old enemy although we don’t need to take out a full page newspaper advert to tell you that…. The league cup semi-final will be shown live in Trafalgar on Sunday evening with a 21.30 kick-off. As we would expect a larger than normal turn out for this match, I have asked Trafalgar to reserve a few more tables than usual and to look at the possibility of putting the game on a few more screens. I would advise everyone to get there sharpish and in good time for the match just in case there are any other matches on involving those not as successful as the most successful club side in the world so that we can all get installed with a good view of the match. We will also be holding a “first & last goalscorer” raffle with tickets only available pre-match. Tickets will be $200 each with up to $2000 available in prize money. All proceeds raised will be going to purchase another 1872 life membership in Rangers First, which you may have noticed yesterday breached the 1 million share mark. 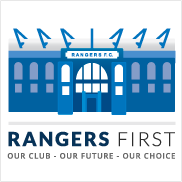 If you combine Rangers First with the RST Buy Rangers campaign the fan groups now own 2.5% of the club. Combined they have almost 11,000 members contributing monthly payments from as little as £5. If you haven’t joined up yet, please do so to either or both. A big thank you to everyone involved in organising last night and great to see such an impressive amount of cash raised for a very worthy charity. On the footballing side, after the midweek win over the Saints in the League Cup, we move to Scottish Cup duty this weekend and at the same ground where we played last weekend. We face Dumbarton in the Cup and the game will be shown as usual in Trafalgar in Wanchai with an 11pm kick-off tomorrow. Remember the clocks have gone back in the UK so games now an hour later for us, so hopefully we will do the business tomorrow and avoid a midweek replay. Thanks to those that attended the recent AGM. It was a relief to finally get it done after a few call-offs! Some of the key highlights include a few changes to committee positions including myself standing down as president – 10 years has been quite enough! I’d therefore like to formally congratulate Darren Hosie as the new president of the club – he is a virtual ever-present at all the games, so I know we are in very good hands. Personally, I will continue on as part of the committee as I have replaced Richard Bulgin as secretary. Thanks for your efforts Richard. Thanks also go out to our outgoing treasurer Gary Stewart who will be departing Hong Kong shortly. Alistair MacLeod has stepped forward to replace Gary. Also thanks to Brian Buchanan for his help on the committee prior to his departure back to Scotland. In my new role, I’ll endeavour to get the minutes out from the AGM in the not to distant future. I’m delighted to say we have filled up our first table for the upcoming charity dinner with Andy Gray & Richard Keys. A number of you contacted me to say you are still waiting on work & travel commitments, so at the moment we have our second table half filled too. If any of you know for sure now, please let me know, or if you have still to get in touch, please do so as soon as possible. For the match tonight, this will be shown live in the Trafalgar – there was a doubt as they had some (much needed!) renovations this week, but all has been completed and the bar will be open for us as normal. Kick-off is 10pm and will be shown via Rangers TV. Andy Gray & Richard Keys Sportsman’s Charity Dinner – Thursday, 30th October 2014. 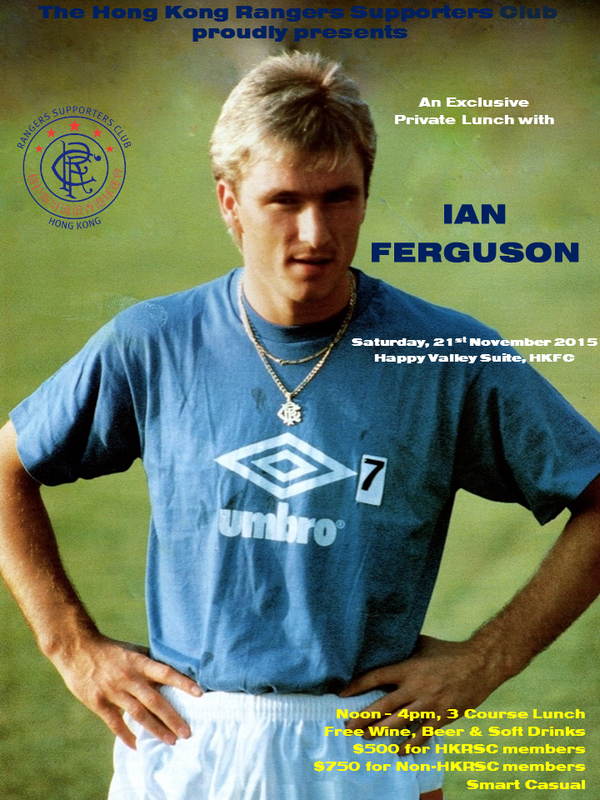 Please find below details of the upcoming Sportsman’s charity dinner with special guests Andy Gray & Richard Keys, co-organised by the Hong Kong Rangers Supporters Club. This dinner will take place at 7:30pm on Thursday, 30th October 2014 at the Hong Kong Football Club. Tickets are $850 each, or $800 for a table of 12 and are all inclusive of buffet dinner, all wines and beverages. All proceeds raised on the night will go towards the Indochina Starfish Foundation – a charity very close to our supporters clubs hearts.